Got a birthday, wedding, anniversary or another important function and don't have a gift? Worry not. Check out our guide to gift shopping in Mumbai, where you find something for everyone. Take a round inside Nirmitee Art Connoisseurs in Dadar to dabble in the Indian handicrafts. Get Rajasthani jhola bags, terracotta pots, wall art, and pretty bells for the home. Read more on it here. Next time you need to find a small gift, visit the quiet, floral store ‘Marry Me’ that sits inside the ever-popular Candies in Bandra (the one in Pali). You’ll get an assortment of adorable knick-knacks from cute tin sugar and cookie boxes for the cooks, funky stationery, little accessories, and even vintage TV-shaped clocks. Read more about it here. Kulture Shop is the place to get your hands on products made by upcoming graphic designers and illustrators in India. Get a funky mug that says ‘I Don’t Give A Font’, cushion covers with ‘dope’ written on it (in Hindi) and more sassy gift items. Find the store opposite Mehboob studios in Bandra West. Bliss is a gift shop in Andheri that may be a little hard to find but once explored, is full of little gems. Attractive stationery, phone covers, funky earrings, F.R.I.E.N.D.S. themed wall hangings are just at the beginning of it. Read more about this adorable store here. You can also check out Inside Out in Bandra for more F.R.I.E.N.D.S memorabilia. The Bombay Store has beautiful items that make for the most thoughtful gifts. When confused with the multitude of options, know that you can head here. A kitschy elephant bedspread, printed umbrellas, colourful accessories and more – head here for a sure-shot find. Get a DIY belt design kit, gorgeous handcrafted journals, a dual colour leather wallet, or leather duffle bags – unique leather products designed with a nuance at Nappa Dori’s flagship store in Colaba. The prices here tend to aim for the roof, so visit it when the bank’s well-stocked. They also have detailed country and world maps that a traveller will appreciate. Read more about it here. P.S. Stationery lovers should also check out a small DIY stationery shop, Sky Goodies in Bandra. It makes the prettiest gifts! Cheap Jack in Bandra is a small store fully packed with cuteness. It has the little-st of things that make for thoughtful gifts – from wind chimes to bulb-shaped glassware, mason jars, greeting cards and more. Read more about it here. We found a shop from our Pinterest dreams in CultR Story, Versova. This store houses all things eclectic – be it a duck-shaped plant pot, dream catchers, quirky cushion covers, wall hangings, maps from around the world, dreamcatchers and more. The items come from around the world and settle here for you to buy. Read more about it here. Remember when Archies was our go-to store for any of our friend’s birthday or even Chrismas & New Year? From greeting cards to photo frames, it was the best collection in town. And now, with Desi Archies, you're really spoilt for choice. They have a super lit collection of handicrafts, home décor, kitchen & dining items, fashion accessories, stationery and barware. The moment you enter the store, you’ll be greeted by a colourful range of kettles, notebooks and showpieces. If you move towards the end of the store, you’ll notice the super cute desi shot glasses, tea sets and cushions. Do not miss their incredible collection of drawer chests. They are perfect for storing all your jewelry. 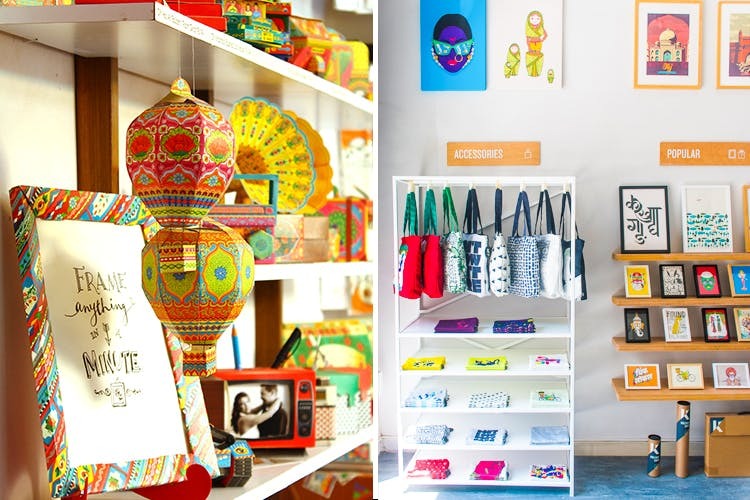 #LBBTip: Look out for stores like Chumbak and Desi Toys that will pamper you with their options.